Can’t get enough of Larissa Ione’s Lords of Deliverance? 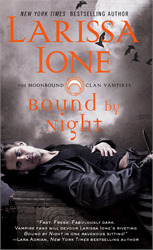 Can’t wait for BOUND BY NIGHT, the first installment of her new Moonbound Clan Vampires series? Then you’ve come to the right place! Join us here at 4pm on 9/27 to participate in the Spreecast live chat with Larissa herself! Just return to this post at the appointed time, click the RSVP button and follow the log in instructions to join the fun! Oh, and if you still want even MORE great stuff from Camp Larissa…be sure to come back to XOXOAD on Sunday for a peek at a fun video. What’s in it? Well, here’s a hint–it involves the delicious cover model for BOUND BY NIGHT! Nicole Martin was only eight years old when the vampire slaves rose up in rebellion and killed her family. Now she devotes her life to finding a vaccine against vampirism, hoping to wipe out her memories--along with her searing attraction for the one man she should hate and fear the most . . .